What is the first thing you think of when someone mentions Archduke Franz Ferdinand of Austria? Most likely you would answer: his assassination at Sarajevo, Bosnia, on June 28, 1914, a tragedy that quickly engulfed central Europe into a world war. The archduke, heir presumptive to the thrones of Austria, was on an official trip to Bosnia, a small, confused parcel of land once a part of the Ottoman Empire, only to be incorporated into another empire, the Austro-Hungarian empire. Bosnia's neighbor, the rather turbulent and belligerent Serbia, with its anti-Austrian government rattling sabres and vitriol, became a hotbed of growing discontent with Austria. Serbia allied itself with Bosnia's southern Slavs. The Balkans were simmering over, finally collapsing into war after Franz Ferdinand and his morganatic wife, Sophie, were assassinated by Serbia, by Gavrilo Princip, a Bosnian Serb, carrying out the final act designed by the Black Hand, formed by members of the Serbian army in 1901 with the sole goal of uniting Serbians under one kingdom. Born in 1863 to Archduke Karl Ludwig and his second wife, Maria Annunciata of Bourbon-Two-Sicilies, Franz Ferdinand, as nephew of Emperor Franz Joseph, grew up in a privileged world. He was given a traditional education, served in the military, traveled, and was expected to marry well. What was not expected was his elevation to the position as heir presumptive. His life changed for ever on January 30, 1889, when his first cousin, Crown Prince Rudolf, took his own life after killing his mistress, Baroness Marie Vetsera, in the imperial hunting lodge at Mayerling. As Rudolf's only child was a daughter, whose dynastic rights came only after all the Habsburg males, the succession to the throne passed to Franz Josef's next brother, Archduke Karl Ludwig, and his three sons, Franz Ferdinand, Otto, and Ferdinand Karl. It was not a family branch that gave Franz Josef a lot of confidence. But as Greg King and Sue Woolmans note in The Assassination of the Archduke (St. Martin's Press:$27.99), Archduke Franz Ferdinand's "youthful privilege gave way to a more contemplative, responsible character in the wake of Mayerling." In contrast to the his debauched brother, Archduke Otto, father of Archduke Karl, Franz Ferdinand accepted his dynastic future, although many in Austria were convinced that when he came to the throne, the monarchy would suffer severe damage. And then there was the little matter of his marriage. Franz Ferdinand, as heir presumptive to the Austro-Hungarian throne, was seen as a major catch for a Catholic princess. He longed for "peace, for a cozy home, and a family." Archduke Isabella, the wife of the very rich Archduke Friedrich, was determined to marry her eldest daughter, Archduchess Maria Christina, to Franz Ferdinand. The story of Franz Ferdinand and Sophie is well known. This was a love match, a true marriage, but a marriage that was not equal. Franz Josef was adamant that the marriage not take place, but when he realized that Franz Ferdinand was not going to give up Sophie, and marry an archduchess, he allowed the marriage to take place. But Sophie, and any children born of the marriage, would not share Franz Ferdinand's rank and title. Sophie would never be empress. Franz Ferdinand signed documents agreeing to all of this. Sophie was created Princess of Hohenberg, and eventually, Duchess of Hohenberg, a title inherited by her elder son, During most of her married life, she suffered indignity after indignity showered on her by court officials. In contrast, Kaiser Wilhelm II treated her with great affection when Franz Ferdinand and Sophie made an official visit to Germany. My personal library has several English-language biographies on Franz Ferdinand, but none compare to the depth of this superb book. Greg and Sue have breathed life into the Franz Ferdinand and Sophie's story, offering perspective and insight into their lives. Although Franz Ferdinand had a role to play as heir to the throne, his first thoughts were always with his wife and their three children, Sophie, Max and Ernst. He reveled in the quietness of his family life at their home, Schloss Konopiste, in Bohemia. Franz Ferdinand preferred his Czech palace to his residence in Vienna. The story of Franz Ferdinand is more than the love and devotion toward his wife and children. He was the heir to a throne caught in the middle of fractious politics, rumblings in the Balkans, leading inexorably to Sarajevo. By 1914, Sophie was able to attend more functions with her husband, and she accompanied him to Germany and England, earning praise from other sovereigns. Thus, Sophie was able to accompany Franz Ferdinand to Bosnia, where the Black Hand's plan came to fruition. 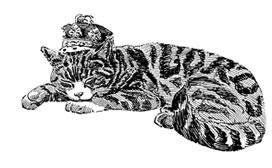 The story does not end with the deaths of Franz Ferdinand and Sophie. The repercussions were far reaching. The assassination is seen as one of the final catalyst of Serbia's determination to be taken seriously, but Serbia's goals soon sputtered to defeat. There were also personal repercussions. Three young children were now without their parents. They were not Habsburgs, but Hohenbergs, and not entitled to family benefits. Franz Ferdinand and Sophie were buried at Schloss Arstetten, their Austrian estate, where they were buried together, equally. Home remain Konopiste until the end of the first world war, when the newly independent Czechoslovakia confiscated the property from the family, stating it was Habsburg property. It did not matter to the new Czechoslovak government that they were breaking the law because the owners were Hohenbergs, not Habsburgs. Franz Ferdinand's great-granddaughter, Princess Sophie von Hohenberg, has been fighting the Czech government for some years, trying to regain the schloss. King and Woolmans were able to access far more than the usual sources as their research found more private correspondence and other materials. 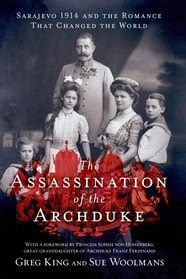 The Assassination of the Archduke is truly enjoyable book that offers new insight into the lives of Archduke Franz Ferdinand and Countess Sophie Chotek, where romance won out over a dynastic marriage. No surprise to see Sue Woolmans interviewed by the BBC - she is a sound engineer in London -- regarding The Assassination of the Archduke which was co-written with Greg King.